Two items of good news: the diary of Alfred Rosenberg and the film "Son of Saul"
Two items of good news, one after the other, for the revisionists: the publication, at last, in French of top National Socialist official Alfred Rosenberg’s diary and the film by Hungarian director László Nemes, Son of Saul. The publication, finally, of Alfred Rosenberg’s personal journal reveals nothing about the existence of a policy of physical extermination of the Jews but, on the contrary, confirms the will of the Third Reich’s leaders to see the Jews disappear one day from Europe to go and create a Jewish national home in Madagascar or elsewhere. Let us recall that Rosenberg [shown above right] was, notably, Reich Minister for the Occupied Eastern Territories, where the Einsatzgruppen (intervention groups) operated, in charge – we are told (with fake evidence in support!) – of exterminating the Jews. He was hanged at Nuremberg. A month ago, on October 15, 2015, the European Court of Human Rights "vindicated" Dogu Perinçek, the Turkish "negationist" of charges that he "denied" the Armenian genocide. Some saw in that ruling the logical possibility that this court would also accept similar challenges to the "Holocaust" on the same grounds. But no. In this 15-minute video, Vincent Reynouard clarifies that the claim for "freedom of speech," which is guaranteed by the French and European Constitutions, will never, under current governments, be applied to speech about the "Holocaust" or "Shoah." He explains that this is because questioning the Shoah is uniquely equated by the Court with questioning democracy, and questioning democracy is an attack on the legal basis of the state ... supposedly a form of sedition. Seeing that there is no way around this for "Holocaust" revisionists at the present time, Reynouard advises that we give up on the Freedom of Speech approach and look for a different one. Netanyahu hates the Palestinians so much that he's now tryng to make them equally guilty with the "Nazis" for exterminating 6 million of his precious jews during WW2. In a meeting with Jewish leaders yesterday, he said the World War II-era Grand Mufti of Jerusalem, Haj Amin al-Husseini, played a "central role in fomenting the final solution" by trying to convince Hitler to destroy the Jews during a 1941 meeting in Berlin. "Hitler didn't want to exterminate the Jews at the time, he wanted to expel the Jews," Netanyahu told the group. "And Haj Amin al-Husseini went to Hitler and said, 'If you expel them, they'll all come here.' 'So what should I do with them?' [Hitler] asked. He said, 'Burn them.'" Sanatorium Fuerth, Vienna: A former hospital which allegedly belonged to Stephan Templ's family before it was "stolen by the Nazis"; in other words, reclaimed by the legitimate Austrian State government of the time. It was returned to Templ's mother after a restitution claim was approved. The heavy hand of International Jewry has fallen again in the form of 75 "holocaust scholars" (what a joke) who have warned the Austrian ambassador in Washington D.C. that his country better not go through with the imprisoning of Jew Steven Templ for fraud against the state or bad things will happen. A letter organized by the David S. Wyman Institute for Holocaust Studies, whose committee includes Elie Wiesel, was signed by the usual culprits: Efraim Zuroff of the Simon Wiesenthal Center, Michael Berenbaum, a former research director of the U.S. Holocaust Memorial Museum. Walter Reich, first director of the USHMM, and Deborah Lipstadt, aggressive bully at large. No other names were reported so I can't say whether there are only Jews on the list, or just mostly Jews. In any case, they are Jews who pretend that they are scholars, and get away with it. Debbie Wasserman-Schultz, DNC Chairwoman and Congresswoman from Florida, has condemned Sen. Marco Rubio for going into a house that contains two Adolf Hitler paintings. And on Yom Kippur too! Isn't it time to quit letting every Jew count for more than anyone else? Jews want to run America as if it were Israel. They think a politician's views on their Big Lie “Holocaust” are the test of his/her fitness to represent Americans in their government. And, as a matter of fact, it's not only one's actual views, but just some peripheral association with items of National Socialist origin that will bring out virulent attacks that are reminiscent of the reigns of Lavrentiy Beria and Josef Stalin, who were such favorites of Jews like Debbie Wasserman's grandparents in their day. This particular Jewess, Debbie Wasserman-Schultz, claims active memberships in the National Jewish Democratic Council, Planned Parenthood, and Hadassah (Women's Zionist Organization of America), which shows her interests are entirely Jewish-oriented and anti-White. Vincent Reynouard produces a brilliant 40 min. video with English sub-titles for students and all people who will be traveling to Auschwitz-Birkenau for the first time. While special teachers "prepare" high school students by having them first close their eyes and imagine the horror that is described to them in order that they will have an emotional experience and "see" what they are "supposed to see," Reynouard tells them to open their eyes and use their critical judgement about what they see while they are there. The Big Lie that is behind pre-conditioning impressionable young people to believe that everything they see at Auschwitz-Birkanau has the most beastial and horror-filled meaning is exposed by Reynouard. He promises a Part 2, dealing with the gas chambers, still to come. Please watch the film, "In Auschwitz, open your eyes and don't listen to the guides" (1) here. The Jewish Forward reports that Austria's president DENIED a request from the Anti-Defamation League to pardon a Jewish journalist/author facing jail time in Austria for omitting to name his estranged aunt, who owned a share of the property, from his family's application for holocaust restitution. Andrew Srulevitch, ADL's assistant director for international affairs, sent the plea to nullify the prison sentence of Stephan Templ to Austrian President Heinz Fischer. The Austrian Supreme Court had in May rejected Templ's appeal of his April 2014 conviction of fraud against Austria. Though he was sentenced to three years in jail, it was later reduced to one year. But even one year is too much for the Jewish brotherhood, served by the ADL. 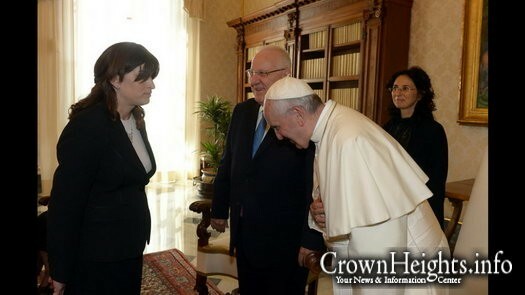 Israeli President Reuven Rivlin paid a visit to Pope Francis in Rome, accompanied by his personal secretary Rivkah – an Orthodox-Jewish woman. When a person usually greets the pope, they shake his hand and bow down. But when Rivkah’s turn came to greet the pope, she explained to him that for religious reasons she could not shake his hand, nor could she bow down since he was wearing a cross. The pope then covered his cross with his hand, and bowed down to her! This is taking Christian humility too far! Picture and text come from this gloating Chabad Lubavitch website. "People confused by the conflicting versions of history, who want to ask questions: why the Jews were victims, and what is the truth? More and more people contact me out of the blue and don’t know what to believe. I take them to the sites of Operation Reinhardt, the worst killing operations, and let them see for themselves." See what? A pile of rocks? Irving has rocks in his head. All designed to give a gruesome effect to what are very unremarkable places. Be sure to take lots of pictures, folks.